"We didn't like each other at all," Linda Cline says about meeting the man who would become her husband of more than 50 years. Love did blossom. The marriage lasted from 1957 until Charlie Cline died in 2012. Along the way, the couple raised two children and had plenty of professional success. Linda Cline is memorializing that love, partnership and most of all her husband with a significant contribution toward a state-of-the-art, multimillion-dollar facility in the Division of Agricultural Sciences and Natural Resources. Construction will soon begin on the Charlie Cline Memorial Equine Teaching Center. Its roots can be traced back through 60 years of unlikely events. In 1954, Linda was in high school and Charlie was a junior-college cadet at Claremore's Oklahoma Military Academy, which is now Rogers State University. One of Linda's best friends was dating a cadet who convinced her to go on a double date with them. "So the guy set me up with a date, but at the last minute, my date had to go on guard duty," Linda says. "Rather than call me and tell me what happened, he paid Charles to go on the date." With a laugh, she explains why she and her backup date didn't like each other. "I wasn't even quite 16 yet, so he was more interested in meeting a couple of my really cute little girlfriends," Linda says. "Fooled him, huh?" After falling in love and getting married, they turned their relationship into a professional partnership. The Clines joined Charlie's brother, Neil, to establish and run Cherokee Lines trucking company from 1963 until 1990. The business thrived, peaking at more than 100 trucks and even more trailers, hauling across the 48 contiguous states. The Clines moved from Oklahoma City to Cushing in 1967. In 1985, they purchased the country acreage on which they planned to retire. "Charles was interested in buying the ranch, so he and I came out and looked at it," Linda says. "I had never lived in the country before. I said, 'OK, but don't expect me to spend all my time out here. We'll keep the house in town.' Then we moved out, and I think I spent two nights in town after that. You'd have to beat me to take me back to town now." Their "ranch" came with no horses. In fact, the only horse either of them had ever owned belonged to Charlie's family when he was a young man. But one Saturday in 1986, he convinced Linda to go with him to Dewey, Okla., to buy "a couple of geldings." They came home with the 17 horses that established Char-Lin Ranch, now a renowned producer of registered quarter horses and Angus cattle. "I fell in love with them," Linda says. "We didn't have anything for them but a shed at the bottom of the hill. Then we hired a young man and his wife who had horse knowledge. They helped us build the barn and got us interested in the breeding of horses. It just went from there." Char-Lin Ranch grew to more than 2,500 cattle and 300 horses, earning more than 200 world and reserve world championships before downsizing in recent years. Steven Cooper, animal-science equine professor, says it is one of the most successful ranches in Oklahoma, thanks in large part to the Clines' enthusiasm and hard work. "This is what they chose to do instead of traveling the world or doing something else in retirement," Cooper says. "They invested heavily with their resources and their time commitment. They showed horses they raised instead of just buying great horses and then showing them." The Clines competed against each other, alternating claims on the foals as they were born. They would each show their own, with the pairs often taking one or both of the world and reserve world championships. Those were win-win situations for Char-Lin Ranch, but the couple made no secret of how much they each wanted their claimed horse to come out on top. Neither Cline attended OSU, but they credit much of their success to the faculty's willingness to visit the ranch, working with and teaching them. "The large-animal hospital was also super helpful," Linda says. "We had everything go wrong that could go wrong. Charles used to joke that we spent so much time at the hospital that they should put his name on one of the rooms. I had that in mind when I heard about the need for an equine center." They also loved the institution where their daughter, Amy, earned a journalism degree. The Clines' son, Cary, has two daughters who are current OSU students. Charlie and Linda supported the university in many ways, including donations to various areas, hiring students to work at the ranch, and inviting the equine and livestock judging teams to use their animals for practice, judging clinics and contests. Cooper met the Clines in 1995 because of their involvement at OSU. He remembers Charlie as a great breeder, businessman and showman who didn't do anything halfway. "Charlie was all-in or all-out," Cooper says. "If you look up 'mover and shaker' in the dictionary, it will say, 'See Charlie Cline.'" Linda adds, "He was one of a kind: a very strong personality and a man of his word. He had some major contracts on a handshake. And everything he did, he did it his way." A crucial development in the ranch's success was the 1989 birth of their first buckskin colt, C.L. Buckley. He became a legend in the halter-horse industry after a humble beginning as the offspring of a palomino stallion and a bay mare. The Clines, who had been successfully showing palominos, first thought Buckley was a palomino whose scores would suffer because the tips of his ears were black. He also only grew to 14.2 hands high, below average for a quarter horse, so some encouraged Charlie to geld him. It turned out he was not a flawed palomino but a world champion buckskin, according to both the International Buckskin Horse Association and the American Buckskin Registry Association. He also was a finalist at the American Quarter Horse Association Amateur World Show. He is even more successful as a stallion, siring more world champions in the buckskin horse associations than any other stallion in the registry. "You seldom find people who haven't heard of Buckley," Linda says. "He is 25 this year, still breeding and a complete gentleman. I've never seen him nip a human. That is unusual for a stallion." He is truly priceless to the ranch. In fact, more than once they turned down unsolicited offers of $100,000 for two of his offspring and an offer to syndicate him. 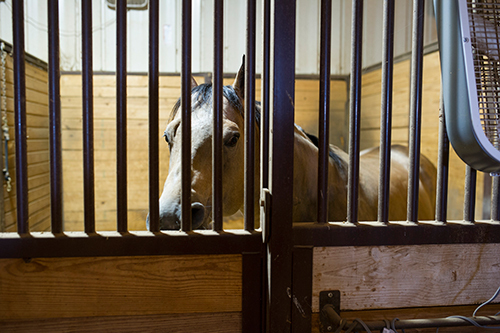 The Charlie Cline Memorial Equine Teaching Center will replace OSU's current building, which was constructed in the 1980s and doesn't lend itself to the current teaching encouraged by equine-industry leaders. The new facility will include a teaching barn with stalls for foaling mares, a small indoor arena, classrooms, feed and tack rooms, a wash rack and treatment area. It will provide space for classes, clinics, 4-H programs and other outreach opportunities. "The Department of Animal Science is grateful and humbled by the generosity of Linda Cline and her family," says Clint Rusk, head of the department. "Their support will allow us to build an exceptional facility for youth and adults, providing cutting-edge knowledge and career-building education in the field of equine studies. It will empower OSU to be at the forefront of equine teaching and fulfill the growing demand for equine education for students and industry professionals." Cooper says Linda is playing a major role in planning the facility because her business experience has taught her what is necessary to make the center great. "She has lived it and built an extremely successful business from the ground up," he says. "That takes time, passion, devotion and a lot of hard work. That's just how they lived their lives." Linda adds, "Charles had such a strong love for animals, and he really valued education. I think he would have really liked this."